Giving advice is as easy as telling someone what to do, and generally as successful. Humans on the receiving end of just about anything meant to help them have a gratifying inclination to rebel against the best intentions. This is especially true when we are our own targets. Resolutions rarely survive to foment revolutions, as much as we would like this to be the case. Lifestyle and happiness expert Christine Carter found herself in precisely this pickle. Because it was both her profession and her passion, she had a knack for guiding others to their goals. In contrast, her own life, which undeniably had many fine moments, was still not the sort of life she'd advise her clients to seek. Physician, heal thyself. Having met her, and read her book, 'The Sweet Spot: How to Find Your Groove at Home and Work,' I can say she managed to make the leap from hope to reality, and her book is an engaging guide to help her readers follow her lead. Science is her friend, and it can be yours as well. 'The Sweet Spot' is admirably straightforward. The introduction sets up her expectations and yours. Her prose voice is plain-spoken, but she's informed by science, not good vibes. She lays out her own problem in terms that make it applicable to just about anybody. She offers a prá cis of how she went about finding more time and making it more productive and rewarding, then breaks it down examines each part and bubbles up enough science to support her conclusions and advice. Carter stresses the import of what she calls recess (time for fun), habits, planning, relationships and flexibility. She offers some smart advice on how to rework these into your life. Her take on habit is particularly engrossing, and her advice throughout is canted towards the doable. Readers who are looking for a prose pat on the back should put this book back. 'The Sweet Spot' is not achieved by high-fives, hugs, or happy thoughts. (The latter is a result, not a solution.) Carter is a pragmatist, not a positivist, and though she emphasizes plans for success, she allows for its opposite. 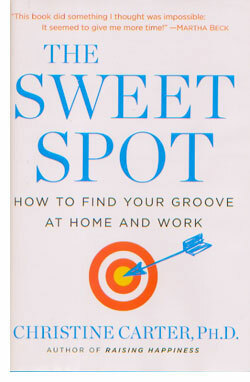 But reading 'The Sweet Spot' gives you an idea of what to aim for and the ammunition to take a good shot. For Christine Carter, prose proves to be a particularly powerful tool with which she is able to share the tools she developed to find the groove that gave her this book. 'The Sweet Spot' is not advice. It's a cookbook.